Our Seaweed Soap is infused with real bits of sea kelp and exfoliating sea salt to gently lift dead skin cells. 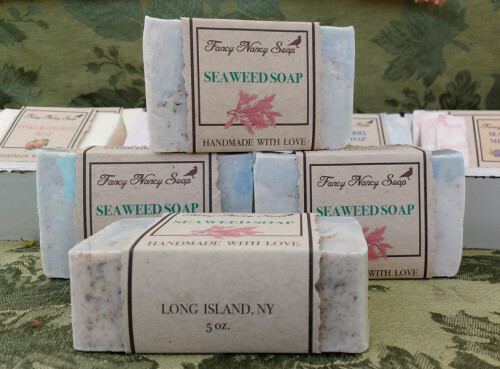 This soap has a very beachy scent with a hint of lavender. Rich in proteins, vitamins, and other nutrients. Ingredients: Saponified Oils of Coconut, Palm, Safflower Seed, Glycerin, Cocoa Seed Butter, Purified Water, Sodium Hydroxide, Sorbitol, Kelp, Sorbitan Oleate, Seaweed powder, Oat Protein, Pink Sea Salt, Essential Oils.